Did you know that the chambered nautilus, unfurling in iridescent spirals, was “one of the first shapes in nature to be granted its own mathematical formula?” In Spirals in Time: The Secret Life and Curious Afterlife of Seashells, Helen Scales explains that as the nautilus mollusk grows it builds one chamber the exact distance from the next as a mathematical sequence Phi, or the golden ratio. The sequence of measurements governing the distance between chambers was identified in the thirteenth century as the Fibonacci numbers . But what is this all of this mathematical elegance for? Think of sunflowers spread wide to the sun or the pine cone seeds in exact “Fibonacci” proportions, every petal or seed occupying the exact distance from each other to maximize photosynthesis. “Build thee more stately mansions, O my soul,” ethereally intoned Oliver Wendell Holmes, but I am much more taken with Helen Scales’s down to earth account of an itchy mollusk secreting the smooth mother of pearl lining to protect its tender skin. And what is the purpose of those lovely chambers? Scales tells us that “Chambered nautiluses use their shells as flotation devices. They’re divided into gas-filled chambers, which boost buoyance and allow the nautiluses to hover effortlessly in the water column, saving energy.” As a result, they gather their food far and wide with exponentially more efficiency than their less evolved relatives, limited to crawling about on the ocean floor. Doesn’t everybody think that mathematical formulas are human inventions? 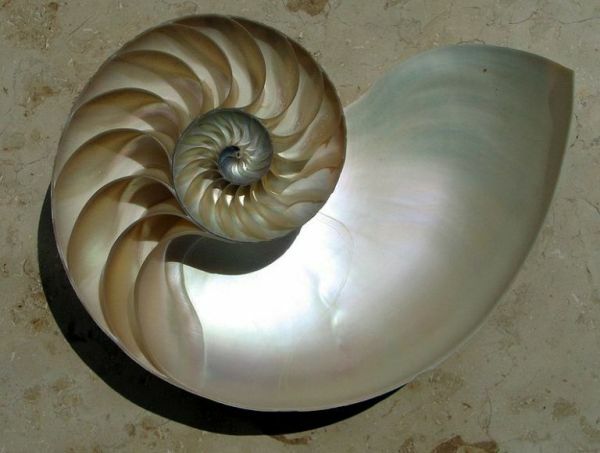 Since the chambered nautiluses, flowers and pinecones existed long before the human species walked upon the earth, Descartes was in no position to “grant” anything to the nautilus, nor does the Golden Ratio “belong” to Fibonacci. We didn’t “invent” mathematics; we merely “discovered” formulas which were already there. It certainly looks like the universe is mathematical!